On this page of Single Malt Whisky are the whiskies from the Benromach Distillery which lies in the Speyside region of Scotland. Located on the outskirts of the ancient market town of Forres in Speyside is Scotland’s best-kept secret. From a small and almost lost distillery emerged a single malt with distinctive qualities reflecting its exclusive hand made credentials as well as encapsulating the self-reliance, sophistication and modern values of Scotland today. Established in 1898, the distillery experienced many closures and changes in ownership before 1993, when malt whisky specialists, Gordon & MacPhail rescued it. 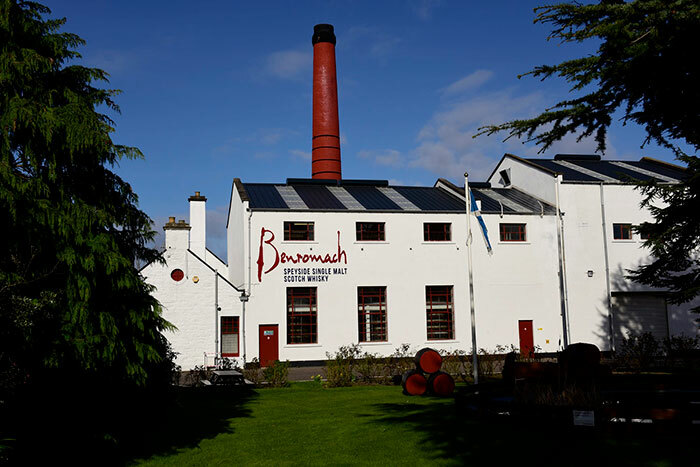 After being extensively re-equipped, Benromach was officially opened by HRH The Prince of Wales in 1998. Just two experienced distillers create Benromach using the finest Scottish barley and the purest spring water from the nearby Romach Hills. They ensure that only the highest quality spirit is filled into sturdy oak casks before being left to mature at Benromach Distillery for many years.